July 25, 2012 — Chiro One Wellness Centers recently welcomed Serena Kleinstub, DC, to the Chiro One family. Recently appointed as chiropractic director of Chiro One of Yorkville, Kleinstub is excited to share the healing power of chiropractic with the Yorkville community and looks forward to educating and serving individuals and families on discovering their full health potential. Originally from Madison, Wisconsin, Kleinstub currently lives in Naperville, Ill. Kleinstub believes in, “creating healthy people with a better quality of life, making healthier choices.” She plans on accomplishing this through powerful education, service, and by setting an example. Kleinstub studied massage therapy at Eastern New Mexico School of Massage Therapy is 2002. 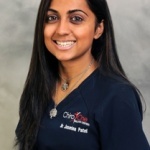 She received her Bachelors of Science degree in Exercise and Sport Sciences from Texas Tech University and later achieved her Doctorate of Chiropractic from Parker University.